In part one we had TRAD TKO Boxing Gym head honcho Johnny Eames talking about both the successful Southern Area Lightweight title defense by his charge Ben Murphy and the Frank Warren promoted event at The Royal Albert Hall, headlined by Billy Joe Saunders, which took place on Saturday night and between them featured no less than five of the famous fight factory’s young stars. 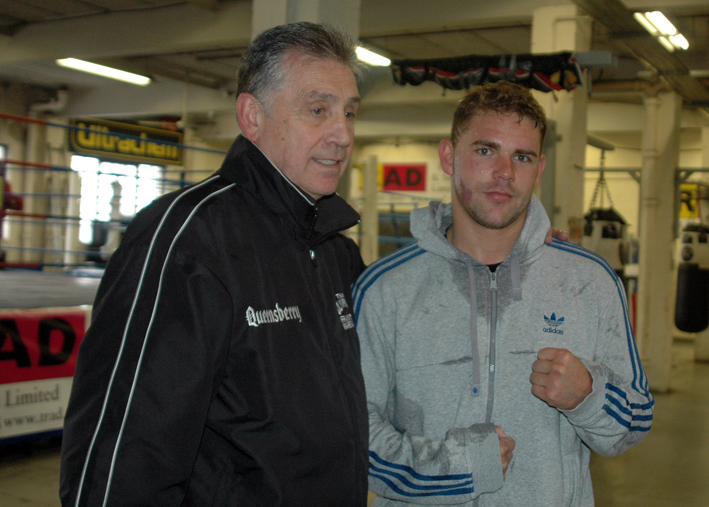 Today it’s the turn of legendary coach Jimmy Tibbs, who will be talking about the fights of those boxers trained by him and his son Mark at the TRAD TKO, especially that of new Commonwealth Middleweight Champion Billy Joe Saunders. Yeah, it was a very successful night and I’m very pleased at the way all the boys performed, it was very good, yeah. Billy Joe, it wasn’t a long fight, thirty seconds someone told me, but he was prepared. Championship fight goes to another level, Billy Joe was really up for it and went out there after the referee’s instruction. None of them was going to give ground, then all of a sudden out of the blue Billy Joe, who’s a southpaw, whipped the left hook over the top of the right lead and this started the downfall for the other boy. Before turning his attention to the other fights an elated Jimmy proudly said, We’ve got a few champions in the gym now, it all takes time and we’re all satisfied with what’s happening. We’ve all trained hard, including the fighters, all the trainers have worked hard, including myself, we’ve all done our part. There’s an old saying “Train Hard, Fight Easy” and really this should be the motto here, because that’s the attitude of all the trainers and fighters at the TRAD TKO Gym. Getting back to his boys and their performances, Jimmy turned his attention to Freddie Turner, Freddie was on last, hanging around all night. I’ve had it before with fighters, you can’t help it. He was a bit lack lustre, he could have been a little more sharper, don’t get me wrong he done more than enough to win. He got a little nick at the end of the fight , which upset him a little bit, but he won easily enough. Next topic of conversation was sensational Super Middleweight prospect Frankie Buglioni. Frankie stepped up to a six rounder, even though it was only his fourth pro outing. In his previous bouts Frankie had stopped Sabie Montieth and Paul Morby, both in the first round, and went the distance against super tough Ryan Clark. Frankie Buglioni, was another one round job. He just went out there and demolished the kid in just half a round. The kid went down three times and the referee, Richie Davis, a good referee, decided it’s only going one way so he did the right thing and stopped it. Frankie’s a very, very good prospect, he’s got to be tested yet but I’m sure he’ll come through when it comes, he’s a very good prospect. Unfortunately it wasn’t a clean sweep on the night, as former Freddie Roach trained Dean “Irish Lightning” Byrne lost, by a close points decision, to Terry Holmes, much to Jimmy’s surprise. The only disappointment of the night was young Dean Byrne. He was unlucky, it was a good eight round fight, nonstop, the crowd loved it, toe to toe. I thought our man just nicked it, or they could have give a draw to keep everyone happy. But the referee see different, but what can you do. Jimmy then went on to talk about the upcoming Francis and George Warren promoted BoxAcademy show, which features three of his young charges, Now we’re looking forward to Thursday at the Troxy, we have three boys Charlie (Hoy), Gary (Corcoran) and Tom (Baker). The boys are all looking sharp, they’ll go out to win, theyÆve done all the work in the gym now so they are ready. WRITER’S NOTE: since the interview was undertaken Francis and George Warren’s Queensberry Promotions “BoxAcademy” event has been canceled. It was a very good night for the TRAD TKO Boxing Gym, besides our boys, Johnny (Eames) and Barry (Smith) were at Kings Cross with Ben (Murphy). They got a good result too, a first round stoppage I heard. All in all we had a good night, besides Dean, we all had a satisfactory night. It may have been a slow start to the new year for the boys from the TRAD TKO but as we head into the Summer it now looks like it’s starting to get busy again. Even though the aforementioned BoxAcademy show has now unfortunately been canceled, various of their fighters are in action over the coming month. On the 12th May Jimmy and British Welterweight Champion Colin Lynes will head to Sheffield, where Colin will defend his title against former WBC Light Welterweight World Champion Junior Witter. Just over a week later Johnny Eames, Barry Smith, Derek Grainger, Brian Lawrence and Alec Wilkey will be with their charges, former British Cruiserweight Champion Leon “Solid” Williams, Menay Edwards, Eric Mokonzo, Areti Mastrodovka, Wadi Camacho and Danny Connor, who will all be in action at the Miranda Carter promoted “Rolling Thunder” event at York Hall on Sunday May 20th. Six days later, on Saturday 26th May, Brian Lawrence and English Light Middleweight Champion Erick “The Eagle” Ochieng will head up the M1 to Nottingham, where young Erick will defend his title for the first time against AA Lowe on the undercard of Matchroom Sport promoted super fight headlined by Carl Froch versus Lucian Bute for the IBF Super Middleweight World Title. One week later, on Saturday June 2nd, Johnny Eames and Barry Smith will make the much shorter journey to the ExCel, where their charges Mitchell Balker and George Jupp will be in action on Spencer Fearon’s Hard Knocks Boxing Promotions next mega event. Tickets for both the Miranda Carter promoted “Rolling Thunder” event at York Hall in Bethnal Green on Sunday May 20th and Spencer Fearon’s Hard Knocks Boxing Promotions June 2nd event at the ExCel will be available on-line at www.tkoboxoffice.com shortly. Tickets will also be available direct from the TRAD TKO Boxing Gym, Gillian House, Stephenson Street, Canning Town, London E16 4SA.